Having a pro-EU government is no solution to the fundamental problems facing your economy if you are middle-sized middle European state like Moldova, says independent journalist and commentator Martin Summers. 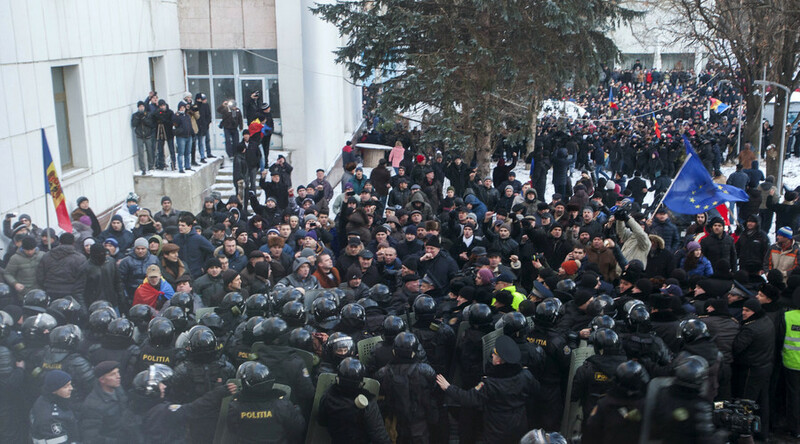 Anti-government protests took place last night in Moldova’s capital, Chisinau. The demonstrators clashed with riot police when attempting to break into the parliament demanding its dissolution and snap elections. Police used tear gas and batons against the angry crowd. 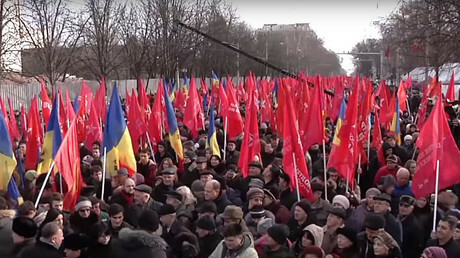 RT: Political protests have shaken Moldova for months why has the instability lasted this long? Martin Summers: You had a pro-EU, largely pro-Western government. But they were brought down by financial scandals and the collapse of the banking system, and a big drop in GDP of the country. So, in a way it is almost like a mirror image of what happened in Kiev a couple of years ago where you had a pro-Russian government being pushed out of power by street protest led by pro-EU demonstrators. This is rather the opposite where the pro-EU government - which has become very unpopular due to its corruption - facing street protest led by those who are not so keen on the EU. And the scenes we saw on the TV with riot police battling with the demonstrators - one can only hope that things will resolve in a more civilized fashion in Moldova than they were in Kiev. RT: Corruption scandals involving top politicians in Moldova emerged amid a difficult economic situation in the country. Did that make public discontent even worse? MS: I think it did. The economic crisis tends to bring political differences to the fore. In Moldova you’ve still got the Trans-Dniester Republic which is sort of Russian speaking which seceded from the main Moldova state many years ago now which is kind of a frozen conflict. The EU itself is in economic crisis. Countries that have been members of the EU for years are having real difficulties. So, having the pro-EU government is no solution for the fundamental problems facing your economy if you are middle-sized middle European state like Moldova. RT: The opposition is asking for another parliamentary election and now the President is delaying the official swearing in of the new cabinet. Will this government be able to take power? MS: I think, what the opposition, which is mainly socialist led in part by a former communist, I suppose, in the Western view, what they want is an election. And I think that is the solution in most situations like this. Just changing the guard at the top without getting the people’s opinion is not terribly sensible. We saw that happening in Kiev a few years ago where the government was changed without an election. And that just led to social polarization and conflict. So, one hopes that what will happen in Moldova is that there will be an orderly election in the not too distant future which can resolve the political direction of the country. But it is very difficult if you’ve got two camps which are at daggers drawn about the direction the country should take. There is no easy solution to that. RT: Opposition leaders called on their supporters to step back, to avoid bloodshed. Do you expect a further escalation of the protest? MS: I think the leaders of the protest have got to make it clear that they don’t intend to try and topple the regime – the current government without an election – but since their main demand is for elections, I think, it is the obvious way forward. It doesn’t resolve the economic crisis but what you want to avoid here is a mirror image situation what we’ve seen in Ukraine which led to the bloodshed and conflict -which is not surely in anybody’s interest.